GUINNESS WORLD RECORDS Adjudicator Christina Flounders Conlon, and Michael McNally display the Guinness World Record Certificate at Star Wars Celebration 2019. Photo by Alex Garcia/AP. CHICAGO, STAR WARS CELEBRATION (April 12, 2019) – To open Star Wars Celebration, the LEGO Group marked 20 years of LEGO® Star Wars™ by achieving a GUINNESS WORLD RECORDS title for largest display of LEGO® Star Wars™ minifigures, kicking off a weekend-long experience. Two decades worth of products, content and collaboration between two of the world’s most beloved brands will be showcased at booth #1616 at McCormick Place in downtown Chicago, giving fans of all ages the chance to relive their fandom and build excitement for what’s to come this Fall. GUINNESS WORLD RECORDS Adjudicator Christina Flounders Conlon counting the stormtroopers at Star Wars Celebration 2019. Photo by Alex Garcia/AP. Made up of 36,440 LEGO Star Wars stormtrooper minfigures, the record-setting display is arranged in the shape of the iconic stormtrooper helmet, measuring 20 feet tall by 20 feet wide. 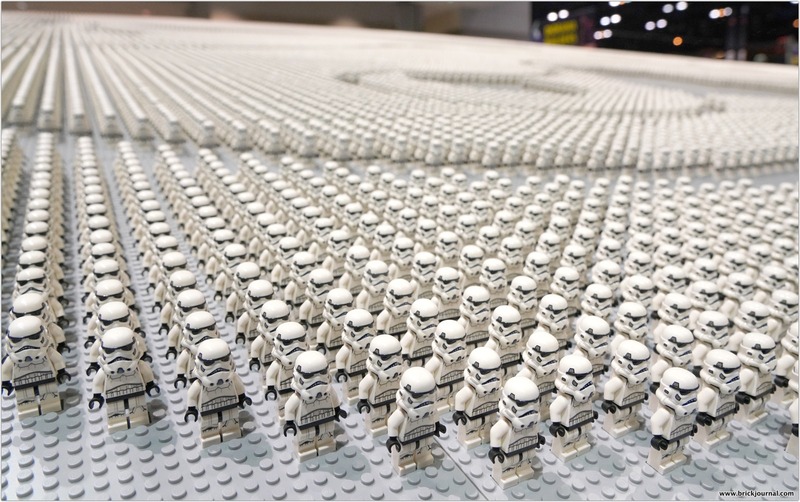 A team of 12 LEGO builders spent 16 hours assembling all of the minifigures, which were then shipped to Chicago to be arranged for display at Star Wars™ Celebration. Once assembled, the baseplates were transported to McCormick Place, where they were arranged for final evaluation by GUINNESS WORLD RECORDS Adjudicator, Christina Flounders Conlon. The collaboration between the companies began 20 years ago when 13 LEGO Star Wars™ sets were introduced at the American International Toy Fair in New York in 1999. The line of licensed construction toys was the LEGO Group’s first licensed property and has since remained one of the company’s most popular, allowing fans across generations and geographies to come together in fun and challenging building exercises. Since the launch, over 700 different sets and more than 1,000 LEGO Star Wars cobranded minifigures have hit shelves. Notable LEGO Star Wars milestones include, the first modeled minifigure headpiece being introduced in 1999 with the Jar Jar Binks minifigure, while new short leg molds introduced in 2002 brought Ewoks and Yoda to life in minifigure form. Beyond construction sets, the collaboration has also produced five video games, several television and web series, and an abundance of other merchandise based on the endless stories, characters and vehicles of the beloved galaxy. Stormtroopers and a fan take a selfie. Photo by Alex Garcia/AP. A glimpse of the LEGO displays at Star Wars Celebration 2019. Photo by Alex Garcia/AP. Earlier this month, the LEGO Group released five special sets featuring iconic ships and exclusive throwback minifigures as another tribute to the LEGO Star Wars history. The new sets – which debuted on April 1 – are a recreation of some of the most iconic and popular sets from the last 20 years, along with a new subtheme: Action Battle. The LEGO System in Play helps Star Wars devotees bring some of their most beloved scenes and characters to life – from Wookiees to Ewoks, Princess Leia to Han Solo and more – for even more intergalactic adventures. LEGO Star Wars Chief Theme Designer Jens Frederick Kronvold adds stormtroopers at Star Wars Celebration 2019. Photo by Alex Garcia/AP. • The LEGO stormtrooper minifigures used in the model are the same stormtrooper minifigures that are in our new 20th anniversary commemorative building set, the LEGO Star Wars Imperial Dropship (available now). Stormtroopers at Star Wars Celebration 2019. Photo by Alex Garcia/AP. ← The LEGO House Unleashes Their Exclusive Set – LEGO Dinosaurs! Visit Bespin’s Amazing Metropolis in the sky—Cloud City!